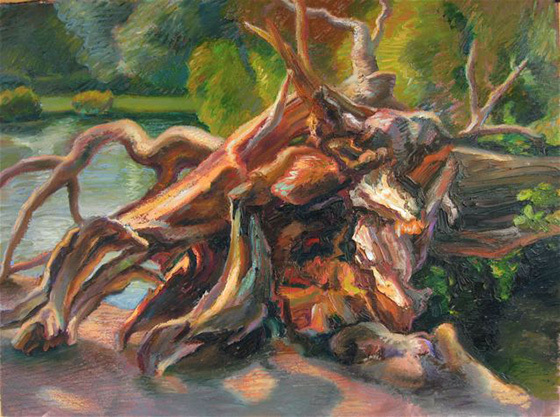 “Fallen on the Fen”, completed in July 2013, demonstrates Carrie Nixon’s current artistic concerns. She started the painting from direct observation on the Boston Fen, where a massive tree had fallen due to a storm. Attracted to the contorted and multi-colored forms, Carrie used pigment sticks (oil paint in stick form) to develop the composition. With the pigment sticks, an artist enjoys the gestural marks of drawing along with the rich color range of oil paint. Carrie is exploring the boundary where painting and drawing meet. Whereas many of her works have involved the human figure, she sees this splayed tree as a human-like form. Carrie Nixon grew up in Detroit, MI, with parents who encouraged her art and travel interests. She has lived in France, Italy, and Peru, and has taught art on the college-level in Michigan, New Jersey, Ohio, and now at Assumption College in Worcester.